The interview of Rep. Lucy Torres-Gomez had evoked a long-buried, intended-to-be-forgotten pessimism over the plight of the country in the hands of our very own people we elected as our leaders. We call it relief operation. People and governments send their help in cash or in kind to agencies they believed will bring such donations to the victims to relieve them of their hunger, thirst, coldness and sorrow, how difficult the ways will be to reach each one of them. True enough, we can see, even only on aired or printed reports, government and non-government organizations mobilizing the relief operations. Four days with nothing. Many victims claim this fact. How can this be possible with the goods in packs and sacks in many areas. How can all these goods we see on TV reach the victims who have nothing for days. It’s unthinkable, at least from our end who are not there in site but tried as much to extend help in our little ways. So the primary culprits are our barangay officials. At least this is how it is with the account of Rep. Lucy. And this is so possible with the way things are done at our own barangays, under normal circumstances. Have you heard of a licensed professional (teacher, nurse, police, engineer) who is to obtain a certification from a local politician as an endorsement and attachment in an application for a local government job for without it s/he can not be prioritized? Where is the spirit of bayanihan among the local leaders? Various media, local and international, report the efforts done by people from all walks of life in different parts of the globe just so each with the intent to help can somehow reach the helpless victims of the strongest typhoon that ever made a landfall on earth. Sadly, for us Filipinos, the major value orientations of particularism, personalism, and non-rationalism are at work to the fullest. And no other than the Yolanda victims are twice, if not in multiples, subjected to tempests in real human-made forms. While relinquishing their rightful duties and obligations (as they should) to the constituents, many local (national even) leaders are over mindful of their future in politics so that they had to print their names on labels of relief goods for distribution. Isn’t it that true service is without counting of efforts. Besides, “to serve” is the mantra our leaders have when they run for office and the mandate they take oath upon when they won. 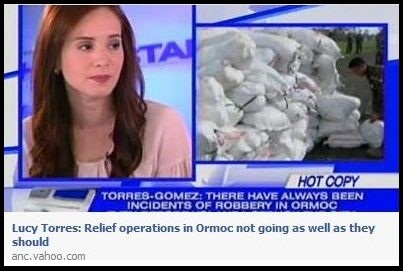 Posted on November 23, 2013, in Society Matters and tagged ANC, Lucy Torres-Gomez, relief operation, yolanda. Bookmark the permalink. Leave a comment.